I’ve always loved the look of alabaster lamps. They’re organic, but in a fancy way. Something about the hard, cold feeling of the alabaster and its subtle glossiness just speaks to me. “Buy me“, they say. There is no way I am paying $50 for you“, I reply. So I was over the moon excited when I found one at the local Goodwill on their 1/2 off day. Marked $6.99, so I paid a mere $3.50 (shade is not included in that price, because then all of a sudden it’s not the deal of the century). 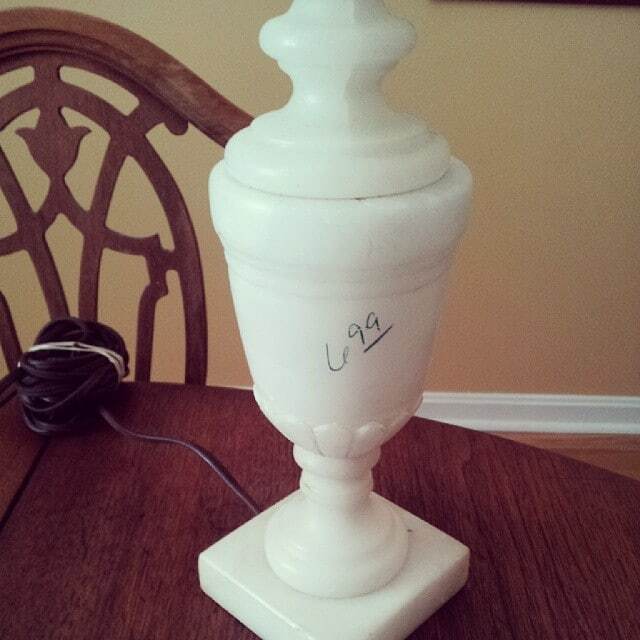 Now if you follow me on Instagram, you know that the silly thrift store workers marked the lamp with a grease pen. Oh, the humanity! Really, on a glass lamp it wouldn’t matter, but alabaster is somewhat finicky about giving up its stains. So this ended up being a bigger deal than the poor thrift store worker may have thought when they priced it along with all the other 4,000 items they priced that day. I ended up getting it off, but not sure I want to tell the whole internet how I did it. 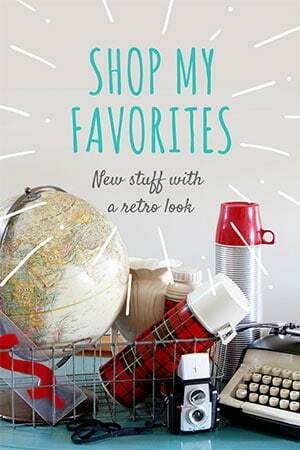 As a lover of all things vintage, I am not proud of it. OK, I can tell just you guys, right? According to all my Googling, you NEVER want to use water or heavy duty cleaners on alabaster or you are in jeopardy of really ruining the piece FOREVER. A lot of people really recommend you JUST LEAVE IT ALONE. Something about alabaster being very porous, very fragile and extremely water soluble. So after reading all of Google’s astute advice, I used Soft Scrub on a q-tip and gently (very gently) rubbed off the grease pen stain and then wiped it down with a damp rag. I know, I broke the cleaning rules!!! Thankfully, I didn’t have any sandpaper nearby or I might have tried that! So far the price hasn’t magically reappeared and there are no huge dents in the alabaster, so I think I dodged a bullet on that one. Now I just have to watch out for the alabaster police. Wow, what a great find! I love the shade you used with it as well! Love it! I am on the look out for alabaster too. I am looing for a pair of these alabaster lamps – have you already sold yours? That is amazing deal. Good for you on breaking a few rules. I think the alabaster police will forgive you. What a gorgeous lamp and what a find for you! Sitting atop the stack of vintage books….awesome! Maybe you should have called the grease pen police….unthinkable that they used that, when they could have used a paper tag with a string, even at our garage sales we have, we don’t write on anything, but use the paper tie-on tags… because we Do sell some antique items…have a great day! It’s beautiful! Thank goodness your removal process worked. 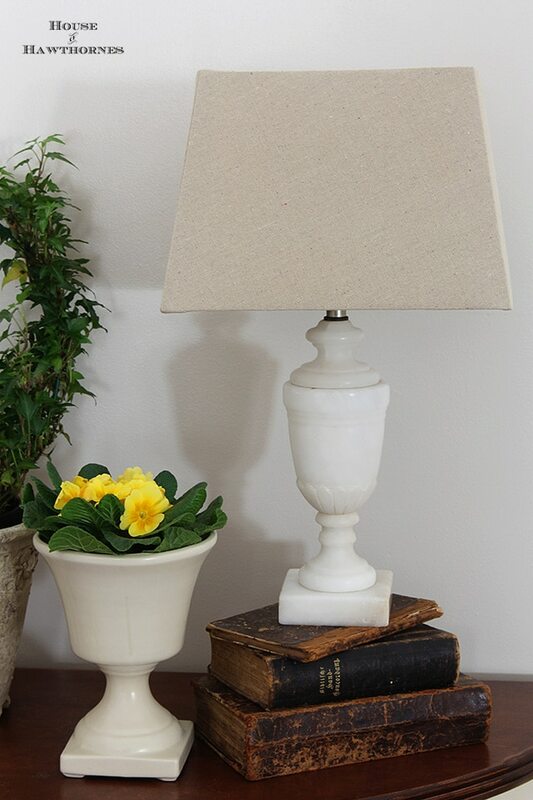 I love alabaster lamps Pam and she’s a beauty…what a steal too! Love how you have her propped on the vintage books. Pam, such a beautiful lamp! You find such wonderful things and now I have put alabaster lamps on my lookout for treasures. The shade you picked makes the lamp look gorgeous! OH, it’s a beauty! 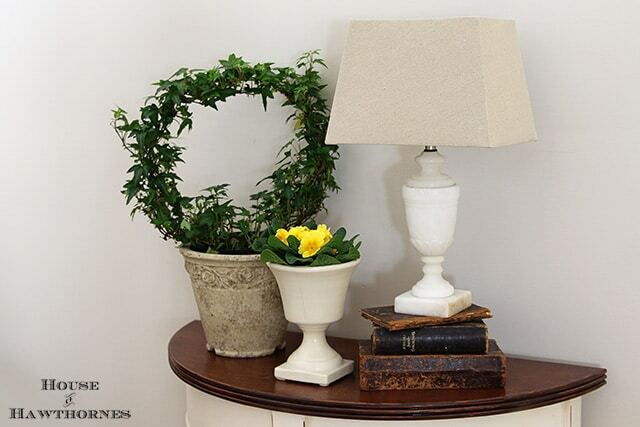 I love alabaster lamps and have a couple in our home…yours was a great deal and a wonderful find! I’m sure of mentioned this before, but maybe, some worker will read and care: the GW workers put the stickers on the manufacturer’s mark or makers mark. Really? Can anyone say, passive aggressive? Or, on the front of an album, on the printing on the cover of a book, the list is endless. Come on people, let’s play nice and be kind, good golly. I am not a fan of those grease pens! I do like the lamp. Oh my goodness what a steal. I sometimes want to pinch the grease pencil people at Goodwill. Have you ever tried a Magic Eraser? It may not have worked but it is my go to trick for the evil grease marks. I thought I did good with my twenty dollar alabaster lamp from the junk shop. They are selling for eighty in resale stores around here now. Thrift store pricing, now that is a topic that all thrifty shoppers have sad tales about. 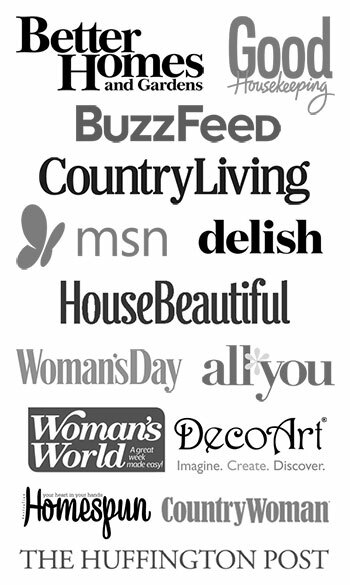 Stickers placed right in the center of an item, for example, a vintage dress pattern, is my pet peeve. Grease pens to mark items is my other pet peeve. Your lamp is lovely, and I am so happy you got the mark off. What were they thinking, geez, glad that you got it off. Great find and perfect price. You always find good things even in the frigid temps. Whatever works 🙂 Lovely lamp…what a bargain!! Beautiful lamp at an unbelievably low price! How can you beat that? You find the best deals! I must start hitting the thrift stores in my area. Great post! We have an alabaster lamp and this is good to know because I wasn’t sure how to clean it. Now I’ll just lightly dust it and enjoy! Oh man I am sick! I cannot believe you payed so little for that lamp!!! My friend who owns an antique place has the identical one and i drool over it every summer. The price?? $80!!!!!! I think i might have considered smacking the thrift store worker! Oh the stupidity! You scored girlfriend! Thanks for letting us know how you removed the stain, your experience may be helpful one day. After reading your newest post, I realized I missed this one! I love your new/old lamp, Pam! Great deal! I visited our local thrift shop to drop some clothing off and bought a bunch of books for only 10 cents apiece. Woo hoo! How do I find the value of my column lamps that my parents bought in Spain in 1956?